This cute little kid really needs your help, cause this is his birthday and he really wants to get the birthday cake. Well, you have a lot of puzzles to solve, so just go ahead and try to help him as soon as possible. Well, can you make him happy again? Just try to solve all riddles to progress through this cute point-and-click adventure game. 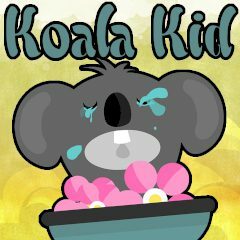 As you have already understood, your mission is that you help the koala bear cub to reach the end of the puzzle where he will have a big party with cake and tam tam. Enjoy the game.